You're running for office, and the last week before election day, you realize you don't know anything about politics! Game includes: procedural generated questions; opponents and more! Use your mouse to navigate the questions. [YES] changes your opinion by +5 percentage points. [FIRM YES] changes your opinion by +10 percentage points. [NO OPINION] changes your opinion by 0 percentage points. [NO] the opposite of yes. 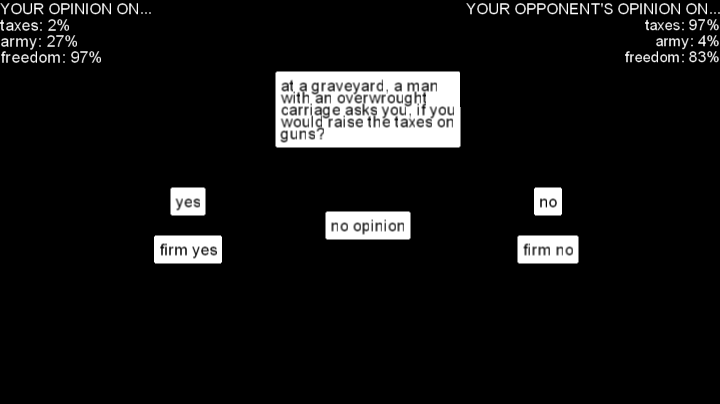 [FIRM NO] the opposite of firm yes. if you you don't wanna read this, I'm sure you'll have fun anyway. (tip: use your opponent, who actually knows a little about politics (but is still trying to figure his own opinions out) to your advantage - remember he's on the opposite side of the political spectrum!) You'll also get visual feedback about your voters ideals, now you just gotta remember that for the next time a similar question comes up. You have to check the polls every 3 rounds, and that's when a day passes. The voters aren't split equally from the beginning, this means you might have a bigger/smaller chance of winning from the start. That's just unfair! There's no confetti on the day before election day? That's a bit too serious. There should totally have been a timer on the questions as Greymanz6 pointed out. Maybe the game is a bit too long. It's sometimes unclear what your voters want. So it sometims just feel like it's random. Some moment, voting no for taxes is good, sometimes it's not. It's hard to figure out what you're expected to do to win. So my trick to win was to reply the right answer for what was generally right then no opinion in everything else and... that's how I won. Having no opinion is great. The proceduraly generated text is awesome! ... but it sometimes makes so little sense that it's not really funny anymore. The game is text based, but the text is not optimal. It would have been nice to work more on the font. For instance, it had close to no separation between lines, which made it harder to read. This is a really funny concept, but it really needed some work on the presentation. That weird because the title / end / confettis are nice, but you kept the default font which is barely readable here. Also the polls are a little unclear. It looks like a bug where some UI disappeared, but the question and answers are still here even if you can't click them. I had the feeling that every opinion that is my opinion is not the opinion of the public. Either It's because I'm not into politics or it's because my opinions are weird.